A whole roasted suckling pig with the eyes intact can be a bit of a bizarre experience for some. For others not. 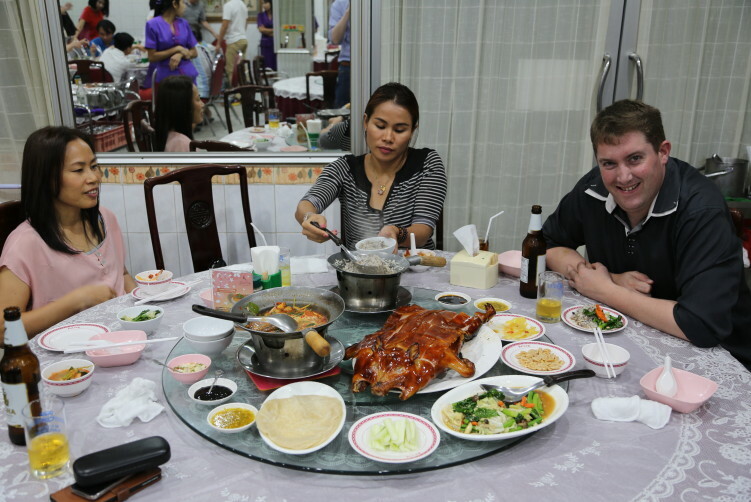 I had to bring a few friends to Tang Jai Yoo in Bangkok’s Chinatown as the whole pig easily feeds four with a couple of other dishes on the table. But the whole roasted suckling pig isn’t the only reason to gather your friends or family. Also most tables are large circular tables with a spinning wheel of glass in the middle to make sure everybody can reach the delicacies. No room for whispering how deep you love your partner or touch hands for the more romantic. You will speak load to be heard and you have no chance to even come close to reach the middle of the table to try catching some skin coming from the other side. Be at least four or have called in advance to make sure you get one of the few smaller tables. The food is kept alive in water tanks. Teochew inspired dishes runs from the roasted suckling pig and stewed goose feet to oysters, mantis prawn, clams, lobsters, turtle soup, sea leech, shark fins, in addition to preparations of the more usual proteins like shrimps, squids, crabs and different types of fish. The seafood is kept alive in big tanks until the order is placed. 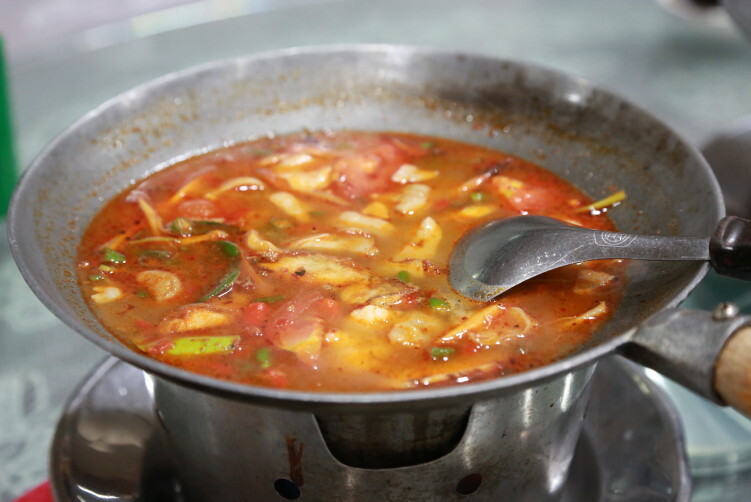 They also have a few Thai dishes like tom yam kung (the famous shrimp soup) and the usual fried rice options. If you’re not in for the suckling pig, you could surely go here for the seafood alone. It’s super fresh and high quality. They have two rather large rooms where they serve the guests. 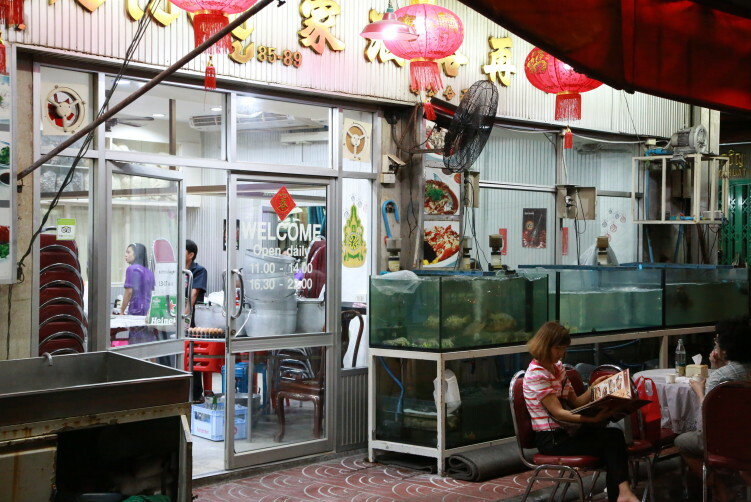 Tang Jai Yoo is filled every night of the week, crowds of Thai-Chinese families (read locals), the after-work groups searching the little extra, and of course a few tourists checking it out as Anthony Bourdain has written about it. But of course he’s not the only one. Also McDang, a famous Thai food critic, raves about Tang Jai Yoo. And let’s be clear. The food spans from good to very good. The set menus is one way to sample a variety of dishes, but as i don’t eat stuff like shark fins and bird nests (due to being endangered species or because only a small part of the animal is used) I always go a la carte when visiting restaurants serving dishes from the Teochew cuisine. The guy took the time to sit down with us to have a chat about the food. The girls in purple serves the food. The man taking the order sat down at the table and gave us the time needed to pick from a rather extensive menu in pictures. We landed on stirred fried vegetables in oyster sauce, a steamed sea bass, tom yam kung (it’s a must when I have the feeling of being in good hands food wise), some stirred fried noodles with shrimps and a portion of stirred fried rice with black olives to check out their western orientation, of course in addition to the whole roasted suckling pig. The roasted pig skin and the whole roasted suckling pig is your best terrestrial options, and that’s also what most people come here for. The skin is the most tantalizingly delicious crispy skin I have eaten. Caramelized to a pure delight, mixed with cucumbers, a thick soy sauce and packed in a thin dough. 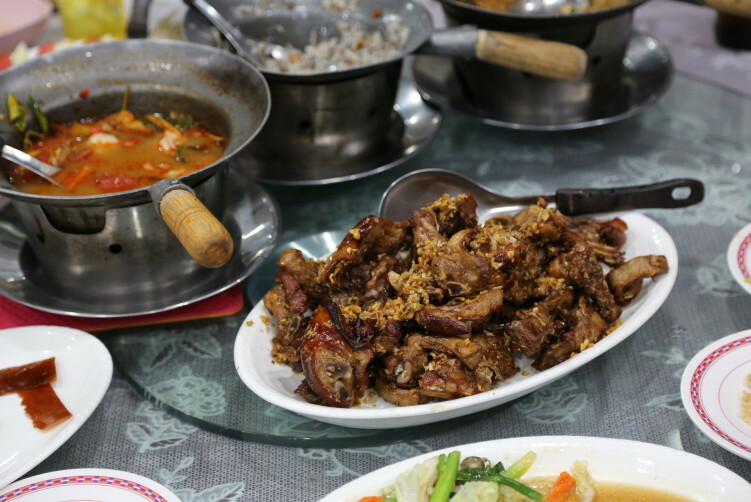 When the crispy skin was consumed, the pig was taken back to the kitchen, chopped into smaller pieces and again fried and prepared before it was brought back to the table. It still had a delicious taste, but the meat could have been a little bit more tender, but we are talking minor issues here. The fish was absolutely excellent, fresh and juicy and full of flavors. The tom yam kung was also very good with excellent balance of spiciness and sourness, and the fried rice with black olives was actually quite interesting, not bad at all. The fried noodles with shrimps was well prepared, but a rather dull and boring experience in comparison to the other dishes. The dinner ends with a complimentary plate of sugar coated cuboids of yam washed down with traditional (very) bitter Chinese tea. Not my cup of tea, but an interesting taste. 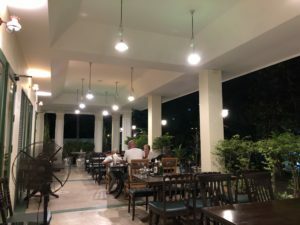 The atmosphere here is as good as the food, loud, lively, and full of happy diners who know they are truly eating a delicious meal. Tang Jai Yoo might seem small from the outside, but it actually features two large dining rooms. But if you thought you would escape the TV when making your booking, forget it. As usual in Chinese restaurants you find the TV in one of the corners, blasting the evening soap operas, giving the high-haired grannies a distraction after dinner as the men do more than just having a small sip from their bottle of Johnny Walker Black Label, well engaged in two or three conversation at the same time. At least it sounded like it. And don’t get me wrong, it’s a natural part of the experience. There is never anything wrong with good mood over good food with something in the glass. 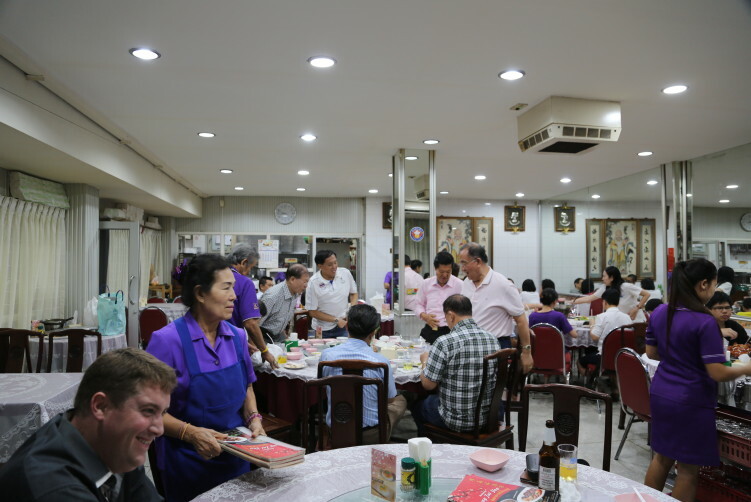 The dining rooms are far from modern, even in Chinese terms. Interior wise they probably are something like 30 years behind the going rate, but that’s not why you come here. You’re here with your friends and family and you talk and eat well. You will soon forget the dullish interior. Sometimes you’ll need to wave for one of the waitresses that has fallen into the soap opera on TV, but otherwise you’re well taken care of. order now Name: Tang Jai Yoo. Also written Tang Chai U.
http://sanfordbiggers.com/bio buy now Food: Teochew cuisine (Chinese) with some Thai inspiration intermixed. Known for it’s roasted suckling pig and seafood. order now Open: 11 am – 2 pm and 4:30 pm – 10 pm. Tang Jai Yoo is rather popular, so it’s best to make a reservation. Price: Moderate to expensive. The whole suckling pig is 1700 bath. click here Address: 85-89 Yaowa Phanit Road/Yaowarat Road. How to get there: Take the MRT (Metro) to Hua Lamphong and walk (12-15 min) from there or take a taxi. An alternative is to take the BTS to Saphan Taksin and then the boat on the Chao Praya river from there. Then you have a 10 minutes walk to Yaowarat Road, but be aware that the boats doesn’t run as late as the MRT. 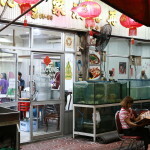 StreetsideBangkok only do reviews of restaurants. You have to contact the restaurant to reserve a table. The location on your map is not correct. The location on google map is correct but the name of the restuarant is wrong spelling. Thanks for your comment. The map is corrected. Do you mean it is written Tangjaiyoo?